Just like human hospitals, animal hospitals can frequently need donated blood to help save the lives of pets who have been injured or suffer from various illnesses. AEC sees thousands of emergency cases each year and we are always seeking to add additional canine and feline blood donors that we may call upon when needed. 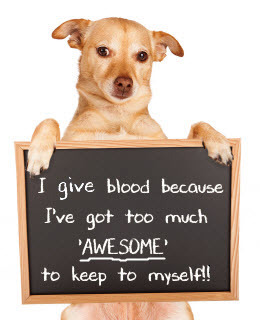 If your dog is able to qualify as a universal blood donor, they will receive $50 per donation, and also receive an annual exam including full bloodwork testing at no cost. Dogs can donate once every 3 months, and giving blood will not hinder your dogs normal activities (e.g. playing with family, agility, flyball, obedience, tracking, etc.). 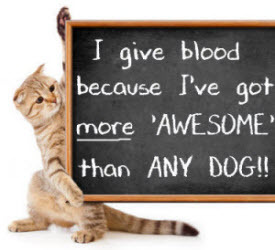 If your cat is able to qualify as a blood donor, they will receive $50 per donation, and also receive an annual exam including bloodwork testing at no cost. Cats can also donate every 3 months. Giving blood will not hinder your cat's normal activities.